every putt is crucial to the outcome. Each putt requires you to decide whether direction or distance is more important. How you see it will determine how best to set up at address. Get it wrong and you could be looking at a three-putt green. Make the right choice and the worst you can do is two-putt on the hole. In the first category are putts within 15 feet where direction is the most important consideration (15 feet is a suggested cut-off length). Here if you miss, it won't be because you have got the distance hopelessly wrong. It will be more a case of your picking the wrong aimline (target line) for the speed you chose. In the second category are putts beyond 15 feet where the objective is to take no more than two putts on the hole. Certainly you may sink the occasional bomb, but the last thing you want is to leave yourself with a difficult second putt. These are the putts where the accuracy is more important than the distance you must roll your ball. Here you should set up with your body parallel to your aimline. In other words your feet, hips and shoulders should be parallel to the line on which you want to start your ball rolling. This is the recommended alignment for putts where precision is essential. Distance is not an issue. It is all about direction. Once you are set up, you should ideally putt with dead wrists in order to maximise the likelihood that you will square your putterface at impact. 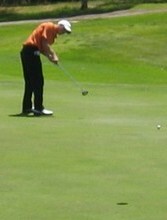 These are the putts that if you execute them poorly, you will either leave the ball short or race it by the hole. While it is unlikely that you will send your ball well wide of your target, there is a good chance that you will badly miscalculate the distance to the hole. It is always easier to judge distance when you are facing your target while standing tall rather than bent over and looking at it from the side. The more you can incorporate binocular vision into your setup, the better you will be able to roll your ball close to the distance required. The technique is to alter your normal setup by turning your body so that your feet and shoulders are more open to where you are aiming. You may even decide to change your grip. You should also stand more erect. 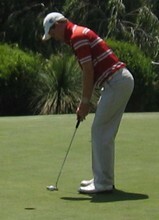 With longer putts you may even have to hinge your wrists a little to get more power into your stroke. Once you have made your choice, you should set yourself up so that you give yourself the best chance either to hole the putt, or leave it stone dead.